I went to see this last week, trying not to have too many preconceptions, but I’d seen the trailers and posters (anyone with an internet connection and a social media account couldn’t have missed them could they?) and I started reading Marvel Comics as a small child, the much lauded “Silver Age”, so I had some context to draw from and the poster I’ve included above particularly reminded me of the Jack Kirby comic books I read as a kid. Despite their problems with gender representation, I’m a huge fan of the Marvel Cinematic Universe and love the Thor franchise – not for the titular character, but for Tom Hiddleston’s version of Loki. Even in the comics way back in the day, Thor was something of a vanilla hero – but Loki was far more entertaining and often provided the comedy that’s been lacking on screen. I’m also a big fan of Taika Waititi’s work as an actor, writer and director, What We Do in the Shadows (2014) is one of my favourite indie comedies. So it was difficult to go into this without some expectations. I really needn’t have worried. 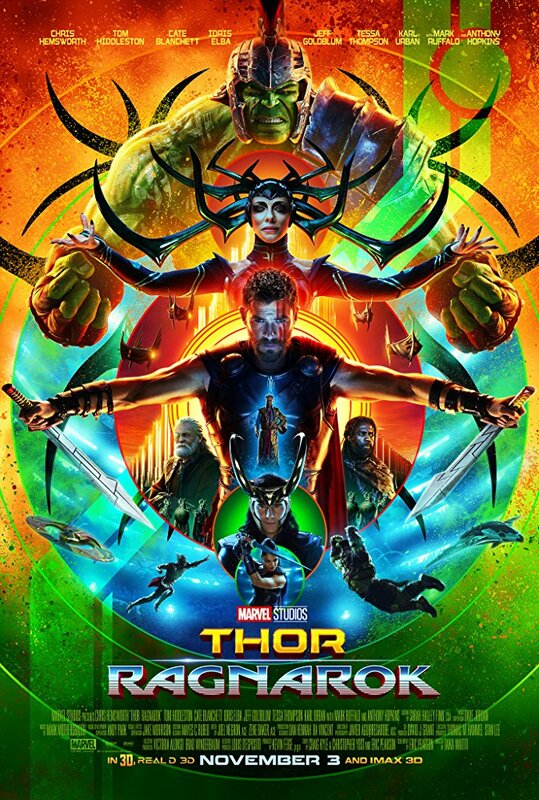 I thought the first Guardians of the Galaxy (2014) was a fabulous and very well timed break in the seriousness of the MCU – but Thor: Ragnarok is a veritable breath of fresh air. I still have some issues but they are minor compared with many of the previous films in this franchise. (I’m happy to discuss in the comments if anyone’s interested). This time the usual cast from Asgard are joined by Mark Ruffalo as Bruce Banner/Hulk, Cate Blanchett as Hela, the Goddess of Death, Karl Urban as Skurge, Tessa Thompson as Val/Valkyrie, Taika Waititi as Korg and Jeff Goldblum as the wonderfully campy Grandmaster. I really loved Blanchett’s villainous Hela, and Tessa Thompson was great as the alcoholic Valkyrie who gets to redeem herself. The sets for the Grandmaster’s planet Sakaar are just wonderful, evoking Kirby’s artwork and the soundtrack (featuring Led Zepplin’s “Immigrant Song”) works really well. A friend described this film as a romp, and I think that’s a great word. This movie is irreverent, loud, brash and very, very funny.